Over the past year or so, Clash Royale game has gained much popularity and more people are asking how to play clash royale on their PC and phones. The surge in the level of participation is just spectacular as it came up from nowhere to hit the market. Having said that, the fact that there are millions of players currently obsessed with Clash Royale game, making it more difficult than ever to succeed in playing the game, hence you need arena strategies to win. Unless you play your cards right (no pun intended), you’ll not find luck in winning, likewise, taking both your skills and excitement of Clash Royale to the next level typically mean, getting yourself empowered with great tips, tricks and strategic rules. You’ll need to be committed to the game, but there are a fair few essential guidelines that can certainly make the process easier. Regardless of whether you’re a veteran or a beginner who has not even tried to download Clash Royale apk, app. Here, we’ve aggregated the strategies of experts to help you making appropriate decision. First and foremost, if you really want to master the art of Clash Royale at the highest level as a beginner or pro, you need to acknowledge the importance of the in-game audio. So much of the information you need to make the right decisions at the right time is transmitted through audio. Meaning that, when you decide to play for a while here and there, either in public or when you cannot hear the sound effects, you are putting yourself at a disadvantage. If planning to play on the go, always carry your headphones with you! 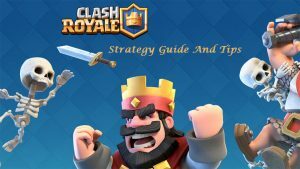 I know you want to learn how to get to legendary and jungle arena of clash royale and to know the best deck to reach these arenas, 6, 8, 10, 11 etc, however, the single most effective and popular strategy among those who’re at the top of the Clash Royale ladder is pure and simple distraction. You may not realize it, but one of the reasons you may be yet to advance your own Clash Royale skills is the fact that you’re allowing yourself to be distracted. The idea being that, rather than having your primary units, you’re giving attention to your opponents, see if you can distract them with some kind of decoy or any number of decoys. Get it right and your primary attack could be so much more effective. While we all have our favorites, it is nonetheless important to ensure that you balance your Clash Royale deck appropriately. The reason being that, if you have a deck that features nothing but ground-based melee scrappers, you are simply not going to have the kind of versatility it takes to overcome your enemies and succeed. There’s no single best deck to help you reaching the arena of your choice. Along with balancing your deck in terms of units, it’s also a good idea to ensure that you have an extensive range of different card values at all times. For obvious reasons, strength in numbers can be your best friend when playing Clash Royale. In order words, it isn’t a good idea to habitually send units out into the wild on their own unless you want them to get destroyed. It can be far more effective to determine which pairings produce combined units that are stronger than the sum of their parts. For example, taking a balloon and sticking a giant in front of it can be a great combination. Just as is the case in every casino on the face of the earth, the key to success lies in knowing exactly how and when to withdraw even while you are ahead. The problem being that, when things appear to be going your way, you will probably find yourself feeling somewhat undefeatable for a while and are so much more likely to make any number of mistakes. Also, if you’ve just won big, celebrate it and don’t get greedy. This is about emotions too, just like when you’ve just won. You should give yourself some time to think logically when you’re already losing. The point is that, during any Clash Royale session, if you find yourself on a losing streak, the best thing you can do is to walk away so that you don’t worsen the loss. The more intensive and extensive the losing streak becomes, the more difficult you are going to find it to make rational, sensible and positive decisions. Take a break and come back to things when you feel a little better. Last but not the least, rather than simply kicking yourself after each loss and vowing revenge, it can be far more effective to question what it is that went wrong. Not to mention, keep something of a diary of your successes and failures along the way. It may sound a little unusual but is nonetheless a super effective way of producing something of a guidebook to follow going forwards. It’s only by considering and learning from your mistakes that you can expect to improve and eventually master Clash Royale. Arulmozhi Ramalingam is a blogger and Content Writer for Clash Royale App APK. She has over 2 years of experience in dealing with various issues related to Android games. She loves to write about the new emerging strategy game, the Clash Royale. I don’t play many games. But, this one does look like fun. I’ll check it out!